Big Ten football preview: How will the Urban Meyer controversy affect Ohio State? Ryan Day (right) will coach Ohio State during Urban Meyer's suspension. The focus of the college football world was on Columbus, Ohio, before Ohio State even took its first snap of the 2018 season. Questioned at Big Ten football media day on July 24 about domestic abuse allegations against assistant coach Zach Smith, whom he had just fired the day before, Buckeyes coach Urban Meyer denied knowing about an accusation against Smith in 2015, saying, "I was never told about anything. Never anything came to light, never had a conversation about it." But a two-week investigation commissioned by Ohio State showed Meyer did know about the alleged incident and mishandled the accusations made against Smith. The coach was suspended for the Buckeyes' first three games but might coach his team at practice after Sept. 2. 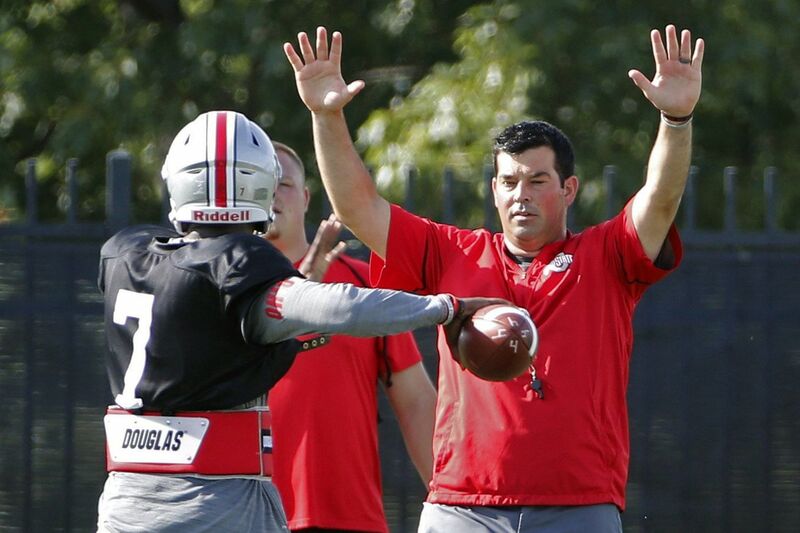 Offensive coordinator Ryan Day is the acting head coach for those first three games. Meyer will return for a Sept. 22 home contest against Tulane, and will hit the road for the first time Sept. 29 when the Buckeyes visit Penn State in what should be a raucous Whiteout at Beaver Stadium. Despite all the criticism levied at their head coach, the Buckeyes remain the favorite to prevail in the ultra-competitive Big Ten East over the usual suspects – Penn State, Michigan and Michigan State – and to repeat as conference champions. The Buckeyes' biggest obstacle to a championship and a College Football Playoff berth is Wisconsin, which played them tough in the title game before losing, 27-21. The Badgers are led on offense by junior quarterback Alex Hornibrook, a Malvern Prep graduate who is in his third season as a starter. Sophomore running back Jonathan Taylor (Salem High School) rushed for 1,977 yards last year and begins 2018 in the Heisman Trophy conversation. Michigan coach Jim Harbaugh starts Year 4 of his tenure with a 1-5 record against his university's two biggest rivals, Ohio State and Michigan State, but he's not on the hot seat yet. A new quarterback, Mississippi transfer Shea Patterson, threw for 3,139 yards and 23 touchdowns last year for the Rebels, and is being counted on to inject some life in a Michigan passing game that ranked 110th in FBS in 2017. Michigan State went from three wins in 2016 to 10 last season and boasts one of the Big Ten's best quarterbacks, junior Brian Lewerke. Rutgers freshman quarterback Artur Sitkowski throws during practice. Speaking of quarterbacks, three Big Ten teams have named true freshmen to start for their season openers: Artur Sitkowski at Rutgers, Adrian Martinez at Nebraska, and walk-on Zack Annexstad at Minnesota. For Rutgers, the installment of Sitkowski at quarterback might seem like a gamble by head coach Chris Ash, but the Scarlet Knights have need an upgrade at the position badly, finishing in the bottom 10 in FBS passing yardage during each of Ash's first two years at the helm.